It can be hard to make friends, and the perpetually lonely Ice King tries to fast-track friendship in “Friends Forever” by taking advantage of the power of the Life-Giving Magus, who brought Ice King’s Fionna And Cake Omnibus to life at the end of “Mystery Dungeon.” That hyperactive living text isn’t the best companion, but it inspires Ice King to use the Magus’ power to make all the objects in his house sentient, ideally creating a slew of new friends to hang out with him. But Ice King’s plans rarely work out the way he intends. His furniture, musical instruments, dishes, and appliances are brought to life, but they are all born with a superior intellect that makes them immediately shun their oafish owner, forcing Ice King to reconsider his behavior in hopes of fitting in. There’s an element of comic absurdity to these lines because of who is delivering them, and it’s pretty sophisticated humor for a children’s show. It’s like Pee-wee’s Playhouse by way of an undergraduate philosophy course, and instead of spreading friendship and happiness, these living objects prey on Ice King’s fear and insecurity. Ice King tries to fit in with his new roommates by listening to Lamp’s advice and reading a few books to expand his mind, but he doesn’t actually process any of this information, and certainly doesn’t know how to employ it in casual conversation. One of the things Ice King reads during his study montage is an issue of Nihilism Funnies, a comic strip rooted in nihilistic ideals. The comic is by Michael DeForge, who is one of this show’s prop and character designers, and it’s another great piece of absurd humor, juxtaposing bright, mostly optimistic imagery with some extremely dour text: “I am an empty shell. Every man dies alone. What makes me different? I am bone and spit and muscle and artery. Slowly being pulverized by weather and time. The weight of 1,000 cities, crashing down on you, your hopes, your will, your children.” I like to imagine kids pausing their DVR to read this comic strip, then turning in horror as they start to comprehend their mortality and the futility of existence. Aren’t cartoons fun? At one point, Ice King tries to make a reference to Aristotle, but he immediately realizes that he’s dug a hole for himself that he doesn’t know how to get out of, so he switches to what he’s comfortable with: making fart sounds with his hands. 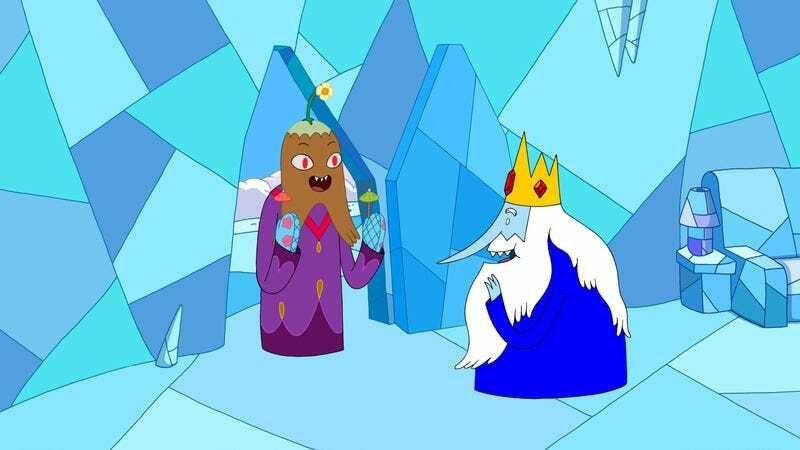 The talking objects represent the more mature side of Adventure Time’s sense of humor, whereas Ice King is channeling the childish comedy that gives the show its playful, fun-loving spirit. The dynamic between these two comedic styles is part of what makes this show so captivating, and this episode dedicates a lot of time to exploring that symbiotic relationship. The objects eventually turn on Ice King as they confront him with all of his personal issues that he refuses to acknowledge, but which they see every day, and when they’ve broken his spirit, they try to oust him from his own home. But when Ice King’s crown is stolen and locked inside Drawer Dresser, the wizard snaps and decides that its time to put an end to his experiment, punching a hole in the furniture, reclaiming his crown, and freezing all the living objects so he can throw them off the side of the mountain. “Oh Ice King,” Lamp says as she watches her brethren fall. “To selfishly create life, then destroy it. 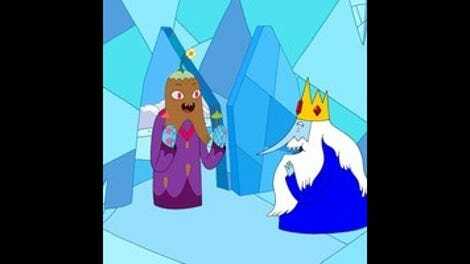 There is no crueler fate.” But Ice King argues that the objects’ total rejection of him is worse. He tried to get on their level, but they never even considered getting on his, and that’s inexcusable to him. So he kills them all. Like I said, this isn’t a particularly uplifting episode, but it doesn’t end on a complete downer. Having survived this ordeal, Ice King, Life-Giving Magus, and the manic Fionna And Cake Omnibus watch the sunset together, and while Ice King turns down Magus’ request to be best friends, he now sees the value in his living book, which provides company without judgment. The “random… words… light up” gag is both very funny and a quick indicator that Ice King has no idea what he’s reading and is just focusing on random spots on the page. Required reading to be smart: Philosophy Smilosophy, A Simpleton’s Guide To Astrophysics, Why You So Dumb? by Smarty McBrainypants, BIG Thoughts Small Book, and The Lighter Side Of Nietzsche (but an old copy of Nihilism Funnies works if you can’t find that last one). Ice King wants to get into improv, and I love the idea of an episode of Adventure Time exploring Ooo’s improv scene. There are so many improv comedians that contribute to this show, it could probably be a lot of fun.